I recently received a request to make the Hope crochet pattern available in Worsted Weight Cotton Yarn – here is the fully revised pattern – enjoy! This hat works up quite quickly using the worsted weight cotton yarn. Cotton is the perfect choice for both warmer climates and summer weather – as cotton is more absorbent and breathes well. The finished hat is super soft and comfortable to wear. To make this hat using Worsted Weight Yarn – Red Heart With Love, please use a 5.50 mm crochet hook and follow the same pattern instructions. I have tested this and it works out to the correct measurements. To make these hats a little longer to reach the base of the ear (rather than mid-ear length) add 4 additional rounds (in the repeat round 10 section). For the Italian Translation please see the following PDF attachment. I would like to thank Barbara for her overwhelming generosity in providing this translation for our readers! Hi Rhondda thanks so much for your kind words & prayers. I got hope done & learned about the magic ring & the stitching in front & back to make the band. I really enjoyed this creation thanks to you. I hope Bonnie likes it as much as I do. Hugs to you from Canada. Hi Rhondda thanks so much for publishing this pattern. My Co-worker of 32 years is undergoing her second time of chemo for ovarian cancer. Her first time was 3 years ago. I had a patient in the office a while ago who was actually crocheting a chemo hat, but I don’t remember who she was & did I think to ask her for a copy of her pattern. No. 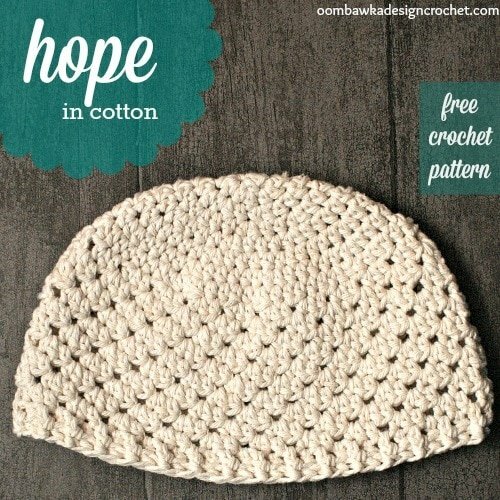 Well Bonnie just lost hair, so I am going to make this hope hat for her. Thanks so much the pattern, I truly appreciate it. Duh, of course! Thanks so much!! Hi Gail 🙂 I have skipped stitches in the rows to make up for the increases – they cancel each other out so in the end you still have the same number of stitches 🙂 So for R9 you skip 1 stitch and in the next work 2 stitches. You have worked 2 stitches over 2 stitches of space. Thank you very much Rhondda for your generosity in sharing this crochet pattern and a few others. All the very best to you. In row 9 and in rest of rows you say to increase stitches, but at end of each of the rows, it still says 63 stitches. How is this possible? Hi Lucy 🙂 Here is a tutorial from Tamara for the Magic Ring / Magic Circle. You can do the chain 3 join to make the ring if you want and pull the end string tightly to close the ring. Having just retired, I have found a lot of time on my hands and have become interested in crochet. This pattern is something I am interested in but I don’t know if it is suitable for a beginner. Also I would not know how to adapt it to men’s sizes. Thanks for the pattern but what is a magic ring how do I make it? Is it chain 3 join to make a ring? Rhondda thanks. I wish could make the same for my son one year son , Mohammad. Thanks a lot for sharing. Hi…Thank you for this free pattern, is each row connected with a slip stitch or worked in the round? thanks so much for the directions. I love this hat. I am looking for directions for a crocheted baby blanket. It has the image of an angel in the middle of it. The over all dimensions are about three feet by four feet. Any help would be appreciated. Thanks so much for this pattern. I make chemo caps and donate them to the cancer site in the Whitney, Texas area. I think this will work well for patients in the warmer weather. I love this pattern as it is an easy enough one to work with. May God Bless you as you continue sharing your crochet patterns. I have been wanting to get one of these patterns. I am a muslim and the men wear a cap very similar to this pattern. God willing I HOPE to make one for my grandson who is 4 mths old.It is not compuls0ry though-it is obligatory. 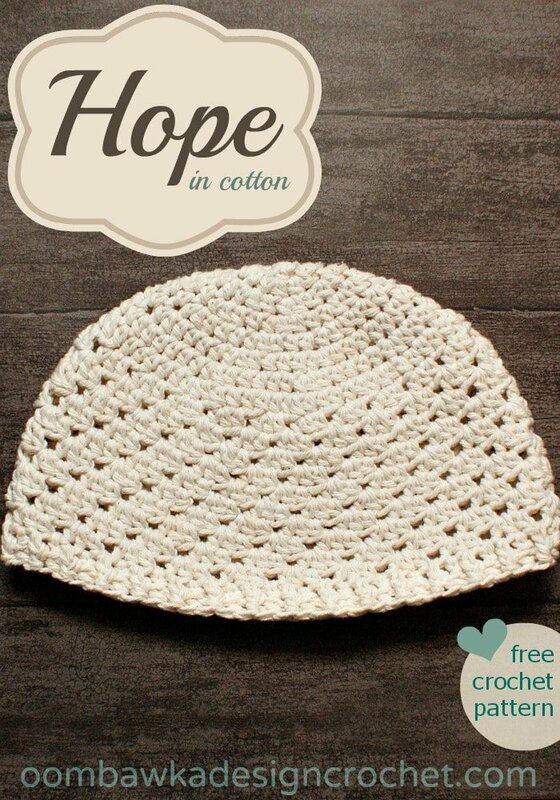 I hope all those who wear this cap will benefit and especially, the grandmas and aunt’s who will enjoy making it and gifting it to them. May the Almighty God Bless in Abundance for yr kindness for sharing this pattern. A’meen. Thanks for such a beautiful pattern! I am starting it now using regular worsted weight yarn and the 5.5mm hook but have a question. At the end of each round, do you join with a slip stitch, or just continue the next round in the first stitch of the previous round? Thanks in advance! Many thanks for your generosity in sharing your patterns. As a beginner I really appreciate your links. Perfect for my niece undergoing chemotherapy. Think I’ll make it today. Is so lovely thiw pattern! I love it! I think this would make a great chemo cap for ladies going through chemo! I love this Rhondda, I made this for my cousin who has been ill! She just loved and of course forgot to take picture:( Thank you for all your lovely patterns.